The Kansas City metro has already been rocked by two major snowstorms this year, and it appears that the area will be receiving one final snow fall before spring. 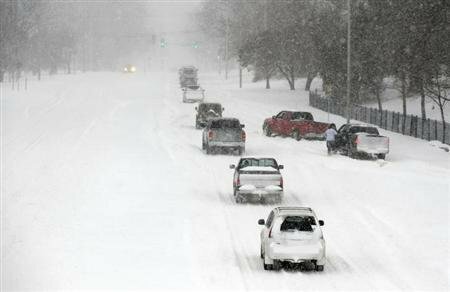 The KC metro is expected to receive up to three inches of snow today, with more snow coming this weekend. Today’s snowfall is expected to start mid-morning and end by the late afternoon. Most snow will fall south of a line from Maryville to Sedalia, with little accumulation north and east of that area. The Kansas City area is expected to receive between one to two inches, while cities to the south such as Gardner, Paola, Pleasanton and Clinton will receive two to three inches. There is also a chance that a bit more snow and freezing rain could hit the metro this evening. The biggest concern is this weekend, when the KC metro may receive upwards of six inches of snow. Meteorologists are expecting freezing rain mixed with snow to start falling from morning to early afternoon on Saturday, with heavier snowfall hitting Saturday night. After some mild winters over the past couple of years, Kansas City has been hit hard with snow over the past couple of months. While this weekend’s storm won’t be as severe as the previous two, there will likely still be several accidents and closed roads. Kansas City will be hosting several NCAA tournament games this weekend, and the downtown is expected to be very crowded. The hazardous weather conditions and large crowds could make transportation around the metro very difficult this weekend. Kansas City residents heading downtown for the NCAA tournament games need to prepare for difficulty navigating around the metro.